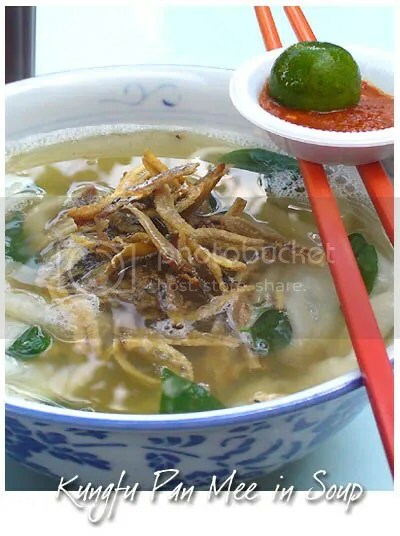 Prologue: Precious Pea’s Breakfast Excursion – Kung Fu Pan Mee | Ipoh Mali Talak Sombong! Precious Pea will be leaving on a jet plane to Melbourne to reunite with her sister and nephew permanently soon, hence she’s been having some aggresive makan trips with her Makan Gang lately. And last month, she gathered some floggers together for a food trip in the Old Klang Road vicinity. There were approximately 14 of us that day! The PJ Gang (notably Unkaleong, NomadGourmand, WMW, SC, Precious Pea, Simon, Citygal, J2kfm and me) met up at the KFC in SS2 before we carpooled and followed Precious Pea’s direction to the hidden area of Taman Sentosa for Kungfu Pan Mee. And yes, we did bumped into the sifus in front of the shop! Ordering was chaotic for such a noisy and big group like us, so we resolved to the “angkat tangan” (put your hands up) method, as if an adult is dealing with a bunch of naughty kids. 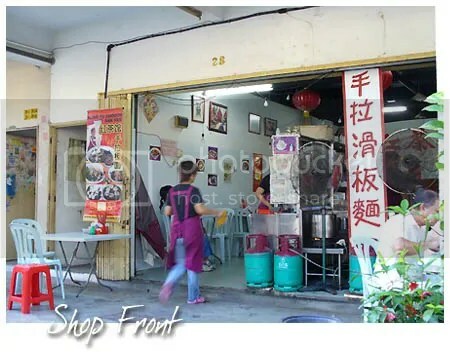 The variety of pan mee they serve here are pretty standard; with soup or the dry version and some other side orders such as pork meat ball, fish balls etc. The soupy version of pan mee arrives first (RM 5 for small, 6 for big). Came with home made sambal and lime, the broth was sweet and flavourful. The sambal packs a punch and goes really well with the noodle. My only gripe would be the small amount of daun cekur manis they threw into the broth. As usual, I had the dry version (same pricing as above). 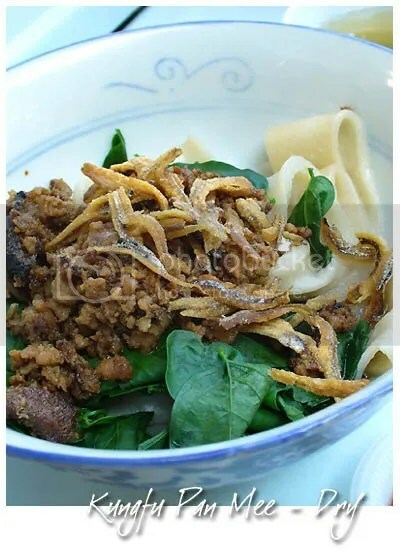 It was laden with minced pork, sliced mushrooms, anchovies and daun cekur manis. We couldn’t just leave the place without trying at least one of their side orders, hence we opted for pandan chicken (RM 4.50 per piece). The size was quite large, but a little greasy. 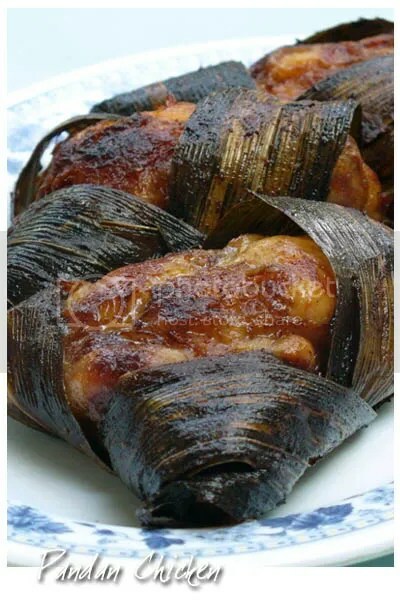 The meat were juicy and well marinated but lacks the pandan fragrance. off Jln Klang Lama, 58000 KL. 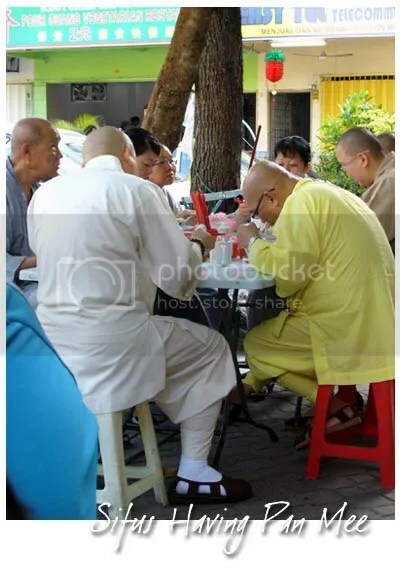 This entry was posted in Food (Old Klang Rd), Gathering, Type: Chinese, Type: Hawker Fare by Jason. Bookmark the permalink. good one. hahhaha …. a little too late, but still ok.
so the beef noodle part to come later? Kung Fu pan mee? hehe. they show kung fu while making the pan mee? Sibu used to have a nice pan mee but the lady die years ago and since then, I can never find a nice pan mee in my hometown. The pan mee you post make me want to eat pan mee now. i went back there again the following week! hehehehe…and even tried the prawn mee a few shops down the road. yeah, i agree that the pan mee was really good. it takes lotsa “kung fu” to make such tender strands! hey hey, i see that monks picture! the shot came out pretty well eh? hahaha.. where’s the rest of the makans? Yep, beef part coming soon. It was an effective way! This one is in between those thin and thicker ones. Really!? How’s the prawn mee? Rest of the makan coming soon. Hahha…I haven’t blogged on this yet! well, I remember reading this somewhere… lol!! Anyway, I’d only been here once… except for the uniqueness of the kung fu ban mee (long strip)… everything was normal!!! Pan Mee can be that good! Esp. 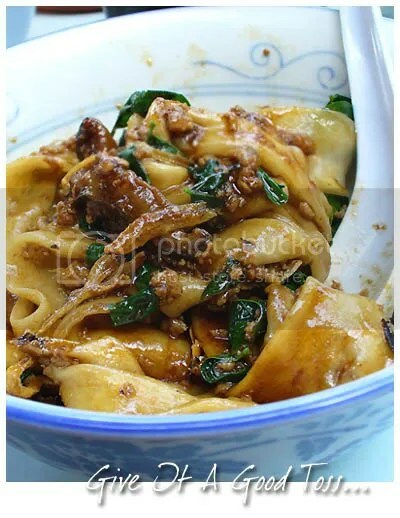 dry ones with the minced meat and sauce clinging to the noodles. How come sifu eating pan mee? they are not vegetarian? 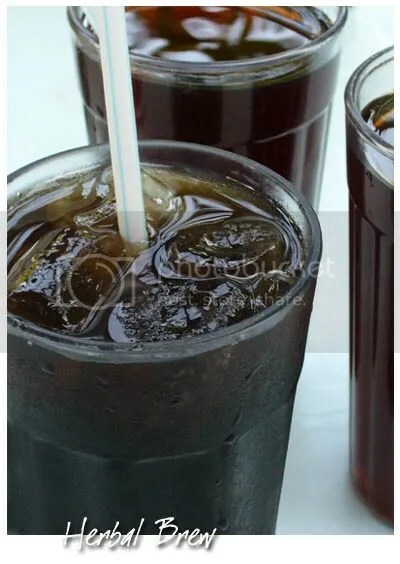 Cikgu, cikgu. Aku nak pan mee. Haha, yeah lah.. we should. When and where? u guys sure can eat!